Northamptonshire (abbreviated Northants or N'hants) is a landlocked county in central England with a population of 629,676 (2001 census). It has borders with Warwickshire, Leicestershire, Rutland, Cambridgeshire (including Peterborough), Bedfordshire, Buckinghamshire (including the Borough of Milton Keynes). Oxfordshire and England's shortest county boundary (19 metres), with Lincolnshire. The county town is Northampton. Pre-Celtic and Celtic peoples settled in the region, and there are some traces of Roman settlements and roads. Most notably the Watling Street passed through the county, and there was an important Roman settlement called Lactodorum on the site of modern day Towcester. There were other Roman settlements at the site of Northampton, and along the Nene Valley near Raunds. After the Romans left, the area became part of the Anglo-Saxon kingdom of Mercia, and Northampton functioned as an administrative centre. The area was overrun by the Danes (Vikings) in the 9th century and briefly became part of the Danelaw, but was later re-claimed by the Saxons. 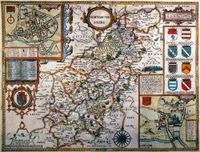 The county was first recorded in the Anglo-Saxon Chronicle (1011), as Hamtunscire: the scire (shire) of Hamtun (the homestead). The "North" was added to distinguish Northampton from the other important Hamtun further south: Southampton. Later, Rockingham Castle was built for William the Conqueror and was used as a Royal fortress until Elizabethan times. The now-ruined Fotheringhay castle was used to imprison Mary, Queen of Scots before her execution. In 1460, during the Wars of the Roses, the Battle of Northampton took place and King Henry VI was captured. During the English Civil War Northamptonshire strongly supported the Parliamentarian cause, and the Royalist forces suffered a crushing defeat at the Battle of Naseby in 1645 in the north of the county. King Charles I was later imprisoned at Holdenby House. In the 18th and 19th centuries, parts of Northamptonshire became industrialized. Northampton and its surrounding areas, gained a sizeable shoe making and leather industry and by the end of the nineteenth century it was almost definitely the boot and shoe making capital of the world. And in the north of the county a large ironstone quarrying industry developed. In the 20th century, during the 1930s, the town of Corby was established as a major centre of the steel industry. Much of Northamptonshire nevertheless remains largely rural. After the Second World War Northampton and Corby were designated as new towns. As of 2005 the government is encouraging development in the South Midlands area, including Kettering and Corby. By the standards of the English Midlands, Northamptonshire is an upland county. It includes the watershed between the Severn and The Wash. Several important rivers have their sources in the north west of the county, these include the River Nene (to The Wash) and the "Warwickshire Avon" (to the Severn). In the 1820s it was boasted that "not a single brook, however insignificant, flows into it from any other district". The highest point in the county is nevertheless the modest Arbury Hill at 225 m (738 ft). Northampton is by far the largest town in the county, with a population of 194,122, this is followed by Kettering (81,842), Corby (53,174), Wellingborough (48,428), Rushden (25,849} and Daventry (22,367). Most of the county's population is concentrated in a central north-south band which includes the four largest towns (corresponding to districts 2, 4, 5 & 6 on the map). The west (districts 1 & 3) and east (district 7) are predominantly rural with small towns and many villages. Northamptonshire is a long, thin county (more so with the Soke of Peterborough), running from south-west to north-east. The Soke of Peterborough, including the city was historically associated with Northamptonshire as the county diocese of Northamptonshire was focussed upon the cathedral there. Northamptonshire returns six members of Parliament. Following the 2005 general election, two of these were members of the Labour Party, the other four belonging to the Conservative Party. Like most English shire counties, Northamptonshire has a two-tier structure of local government. 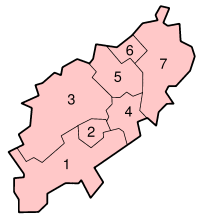 The county has an elected county council based in Northampton, and is also divided into seven districts each with their own district councils. These districts are : Corby, Daventry, East Northamptonshire, Kettering, Northampton, South Northamptonshire, Wellingborough. The district council offices for East Northamptonshire are based in Thrapston, and those for South Northamptonshire are based in Towcester. Northamptonshire also has a large number of civil parishes. Until 2005, Northamptonshire County Council, for which each of the 73 electoral divisions in the county elects a single councillor, had been held by the Labour Party since 1993; before then it had been under no overall control since 1981. The councils of the rural districts — Daventry, East Northamptonshire, and South Northamptonshire — are strongly Conservative, whereas composition in the urban districts is more mixed. At the 2003 local elections, Labour lost control of Kettering, Northampton, and Wellingborough, retaining only Corby. Elections for the entire County Council are held every four years — the last were held on 5 May 2005 when control of the County Council changed from the Labour Party to the Conservatives. The County Council uses a leader and cabinet executive system and has recently (from April 2006) abolished its area committees. Northampton itself is somewhat unusual in being the most populous urban district in England not to be administered as a unitary authority (even though several smaller districts are unitary). During the 1990s local government reform, Northampton Borough Council petitioned strongly for unitary status, which led to fractured relations with the County Council. Northamptonshire is policed by Northamptonshire Police, and is covered by Northamptonshire Fire and Rescue Service. 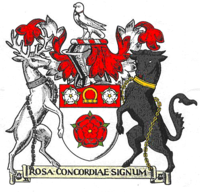 Before 1974, the Soke of Peterborough was considered part of Northamptonshire for ceremonial purposes, although it had had a separate county council since the 19th century, and separate Quarter Sessions courts before then. It is now usually considered to be a part of the ceremonial county of Cambridgeshire. This is a chart of trend of regional gross value added of Northamptonshire at current basic prices published (pp.240-253) by Office for National Statistics with figures in millions of British Pounds Sterling. The gap in the hills at Watford Gap meant that many southeast to northwest routes passed through Northamptonshire. The Roman Road Watling Street (now part of the A5) passed through here, as did later canals, railways and major roads. Major roads such as the M1 motorway and the A14 provide Northamptonshire with valuable transport links, both north-south and east-west. The former steelworks town of Corby is now home to large areas of warehousing and distribution companies. Two major canals - the Oxford and the Grand Union — join in the county at Braunston. 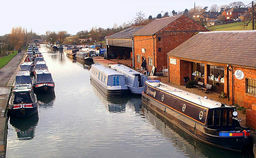 Notable features include a flight of 17 locks on the Grand Union at Rothersthorpe, the canal museum at Stoke Bruerne, and a tunnel at Blisworth which, at 3076 yards (2813 m), is the third-longest navigable canal tunnel on the UK canal network. Two trunk railway routes, the West Coast Main Line and the Midland Main Line traverse the county. At its peak, Northamptonshire had 75 railway stations. It now has only five, at Northampton and Long Buckby (on the WCML), Kettering and Wellingborough (on the Midland Main Line), along with King's Sutton, which is a matter of yards from the boundary with Oxfordshire on the London-Banbury line. Corby is one of the largest towns in Britain without a railway station. A railway runs through the town (from Kettering to Oakham in Rutland), but is currently used only by freight traffic and occasional diverted passenger trains (which do not call). The line through Corby was once part of a main line to Nottingham via Melton Mowbray but the stretch between Melton and Nottingham was closed in 1968. In the 1980s, an experimental passenger shuttle service was tried between Corby and Kettering, but this was proved unsuccessful. A bus link operated by Midland Mainline provides access to Corby from Kettering station. As of 2005, there are plans to build a new station in Corby - one providing direct access to St Pancras in London and not just a branch line service to Kettering, but these are not yet off the ground. Northamptonshire was hit hard by the Beeching Axe in the 1960s, stations such as Towcesters being slowly left to rot. One of the most notable closures was that of the line connecting Northampton to Peterborough by way of Wellingborough, Thrapston, and Oundle. Its closure left eastern Northamptonshire devoid of railways. Part of this route has been re-opened as the Nene Valley Railway, with a small section of line, and the station at Yarwell junction being within Northamptonshire. A section of one of the closed lines, the Northampton to Market Harborough line, is now the Northampton & Lamport heritage railway, while the route as a whole forms a part of the National Cycle Network, as the Brampton Valley Way. As early as 1897 Northamptonshire had its own putative Channel Tunnel rail link with the creation of the Great Central Railway, which was intended to connect to a tunnel under the English Channel. Although the complete project never came to fruition, the rail link through Northamptonshire was constructed, and had stations at Charwelton, Woodford Halse, Helmdon, and Brackley. It became part of the London and North Eastern Railway in 1923 (and of British Railways in 1948) before its closure in 1966. Before nationalization of the railways in 1948 and the creation of British Railways), Northamptonshire was home to three of the "Big Four" railway companies; the London, Midland and Scottish Railway, London and North Eastern Railway and Great Western Railway. Only the Southern Railway was not represented. Post nationalisation, it is served by Silverlink, Central Trains, Chiltern Railways and Midland Mainline. So from having 75 stations in 1948 and three operators it has 5 stations with four operators. Northamptonshire has a local BBC radio station, BBC Radio Northampton, which broadcasts on two FM frequencies — 104.2 MHz for the south and west of the county (including Northampton and surrounding area) and 103.6 MHz for the north of the county (including Kettering and Corby). There are three commercial radio stations. Northants 96 (96.6 MHz FM) is part of the GWR Group, whilst AM station Classic Gold (1557 kHz) also forms part of a national network. The former Kettering and Corby Broadcasting Company (KCBC) station originally broadcast on 1530 (later 1584) kHz AM before eventually moving to 107.4 MHz FM. Its studios and FM frequency are still in use following a merger with Wellingborough-based Connect FM which now broadcasts on 97.2 and 107.4 MHz. National digital radio is also available in Northamptonshire, though coverage is limited. As of 2005 a multiplex for local DAB stations had yet to be set up. 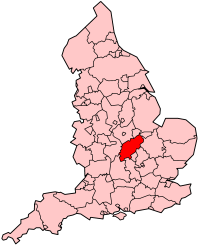 In regional radio and television terms, the county is not usually considered as part of the East Midlands; unusually, it is associated with East Anglia, being part of the BBC East region and the Anglia television region of ITV, the latter having an office adjacent to BBC Radio Northampton in Abington Street, Northampton. These services are broadcast from the Sandy Heath transmitter. Northamptonshire is home to a number of football (soccer) teams, notably the professional sides Rushden & Diamonds F.C. and Northampton Town F.C., both of which are currently in Football League Two, although Rushden and Diamonds were relegated at the end of the 2005/2006 season and will play in the Conference for the 2006/2007 season. Other teams include Kettering Town F.C., which is in the Conference North, though having been higher. Wellingborough Town Football Club claims to be the sixth oldest in the country. Northamptonshire is more successful in rugby union, where Northampton Saints are in the Guinness Premiership (the highest league). Northamptonshire County Cricket Club is presently in Division Two of the County Championship. Silverstone has a major motor racing circuit, notably used for the British Grand Prix. Rockingham Speedway in Corby is a US-style elliptical racing circuit (the largest of its kind outside of the US), and is used extensively for all kinds of Motor Racing events.